High-tech simulations transport students into emergency situations and inside human organs. But are they the best way for students to learn? As a first-year resident at Children’s Hospital Los Angeles (CHLA), Travus White, MD, stood in a trauma bay, directing a team rushing to save a toddler with a life-threatening allergic reaction. As adrenaline coursed through his body, White scanned nearby carts for treatments. None, when administered, seemed to have any effect. “What I remember the most was that the respiratory therapist kept saying, ‘He’s not breathing, he’s not breathing, he’s not breathing!’” notes White. But he pressed on, using the algorithm he’d learned in training. Soon the patient responded, and White shook off the stress as if waking from a dream. In fact, the whole scenario had happened in White’s mind — thanks to a pair of virtual reality (VR) goggles and software developed with the help of CHLA educators. The patient and emergency staff were merely animations programmed to respond realistically to trainees’ split-second decisions. White is among a growing number of learners at medical schools and teaching hospitals who are training through computer-generated simulations thanks to VR and its cousin, augmented reality (AR). These sophisticated tools allow learners to plunge safely into life-or-death scenarios, peel away layers of human anatomy, walk through a virtual heart, and more. 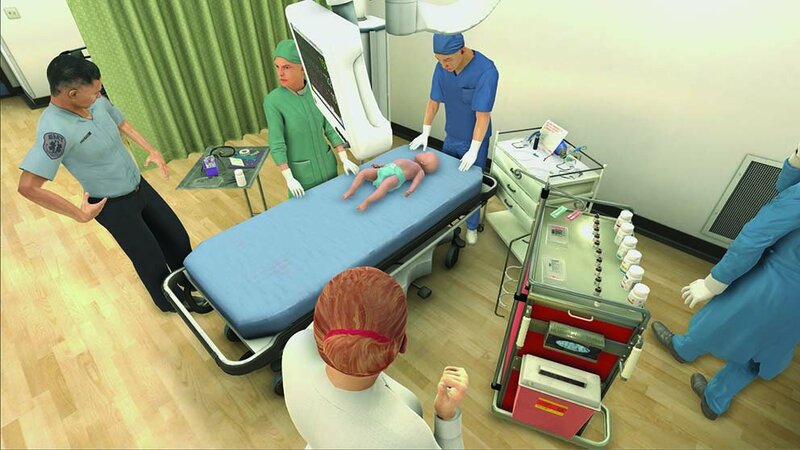 As technologies from the gaming industry improve and costs decline, leaders in academic medicine are increasingly exploring the place of such simulations in medical education. Although there is no hard data, an increasing number of medical schools are using or considering these technologies, says Warren Wiechmann, MD, associate dean of clinical science education and educational technology at the University of California (UC), Irvine, School of Medicine. Wiechmann points to the topic's popularity at the AAMC’s Group on Information Resources annual conference in June, where several sessions focused on virtual reality. “The room was packed for all of those sessions,” he says. Early adopters note the varied benefits of AR and VR, including the opportunity for real-life experiences without real-life consequences. “You don’t get that feeling of adrenaline through a written test,” says White. “You get it through experiencing it, and I think this is as close to experiencing it in real life as you can get.” Todd Chang, MD, MAcM, director of research and scholarship at CHLA, notes that once students get immersed in one of his VR modules, their heart rates rise about 10%. But the place of these technologies in academic medicine certainly is not yet clear. Among the questions are whether research will support their educational promise. Computer-generated simulations are usually divided into two categories, virtual reality and augmented reality. They are similar, but different. Virtual reality is an entirely computer-generated view of a world — that is, purely virtual. Everything the user sees is manufactured, like the CHLA trauma bay scenario White experienced. Augmented reality, by contrast, superimposes computer-generated images and sounds onto the real world. In medicine, this includes simulated internal organs overlaid on a real manikin. Because the AR experience isn’t completely immersive, it doesn’t necessarily require goggles: holding up an iPad might suffice to superimpose the image, for example. Two years ago, faculty at Stanford University School of Medicine began using VR for training in its Neurosurgical Simulation and Virtual Reality Center. There, a platform called Surgical Theater fuses several types of brain scans from a real patient to achieve greater specificity and verisimilitude. 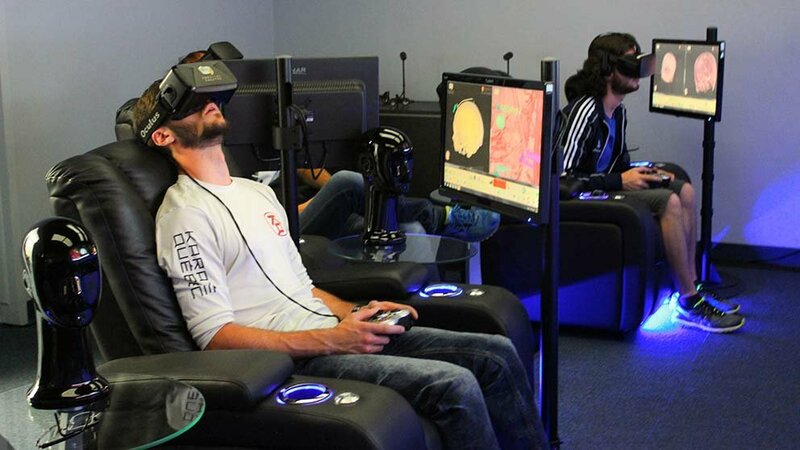 Seated in comfortable, theater-style chairs and wearing VR goggles, users can manipulate and view the organ from multiple perspectives. The experience feels a bit like flying through a detailed and lifelike human brain. “The beauty of this is really that you can appreciate in three dimensions what the structures look like,” says Gary Steinberg, MD, PhD, chair of neurosurgery at Stanford. After the VR experience, students step across the hall to the neurosurgical anatomy lab, where they see and touch the same anatomical structures in a cadaver. The virtual reality warmup prepares students for dissection, says Steinberg, and speeds up learning. Steinberg raves about virtual reality in medical training. “It’s obvious,” he believes. “It’s intuitive.” In fact, Steinberg often prepares for surgery using a VR representation of a patient’s imaging. Augmented reality takes simulations and combines them with real-world tools and interactions. At the Mayo Clinic Multidisciplinary Simulation Center, instructors use AR for various purposes, including to teach students how to interpret ultrasound imaging. As students look at a standard ultrasound view, AR adds images of underlying tissues, bone structures, blood vessels, muscles, and nerves for a deeper understanding of the ultrasound visualization. Because the experience is not entirely immersive, students can interact with each other and the instructor while viewing the module, explains Thomas Belda, MS, a Mayo enterprise simulation technology architect. “With augmented reality, the capability is greater for having multiple users experiencing something together [to] interact collaboratively in a clinical scenario during simulation training,” he says. At the UC Irvine School of Medicine, faculty recently launched an AR pilot project for fourth-year students and emergency medicine residents. There, a computer app superimposes a hologram of a patient over a manikin to produce a much more lifelike and responsive simulation, says Wiechmann. Despite their enthusiasm, even proponents of AR and VR advise caution, stressing the need to prove the solid value of these tools. So far, there’s little published research on the effectiveness of VR and AR in medical education. He’ll likely find willing partners. Meanwhile, as prices fall, the capabilities of the technology grow, and developers create new teaching modules, a trend toward greater use of virtual and augmented reality in teaching and training seems almost guaranteed.